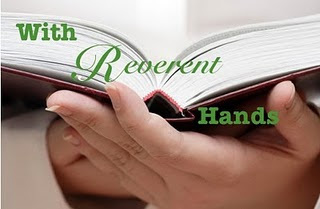 If you would like to participate in With Reverent Hands, please comment on this post and I will send you a template! This week's guest blogger for With Reverent Hands is Blodeuedd who blogs at Bookgirl of Mur-y-Castell. She's chosen a book that is fairly well known in the fantasy genre but that doesn't seem to be as loved as it deserves in the wider reader community. Blodeuedd reads and reviews a wide variety of books on her blog, but has a true love for fantasy, so it was no surprise that she chose the below book to spotlight. She writes really candid and honest reviews, which I love and appreciate, and I'm thrilled that she was the first to volunteer to participate in this series! Thanks so much for highlighting a book you revere, Blodeuedd! In 2001, in the summer, and it might have been my first really big book in English. I devoured it, and then had my dad to drive me to the library so that I could get more by Feist. I fell in love with the book and to this day I think it is the single greatest fantasy book ever written, to be truthful it is the best book in the entire world. It starts with a young boy named Pug who lives in a castle with his friend Thomas. They are 13 and it is time for them to get chosen for apprenticeships. Thomas gets to be a soldier, and Pug gets chosen to become a magician. But something seems to be wrong and he can't find his power. Three years goes by, and a strange ship comes to their northern shores. Soon the world is at war with strange people from another world, and the country itself is on the brink of civil war. Then Pug and Thomas are separated and each will find a higher destiny. Pug in another world, and Thomas will fight along side elves and dwarfs, and something ancient and dark. As the world is falling apart will there be a solution? Then there is the ancient dreams, political intrigues, the strange new world, evil dark elves and fearless invaders. And war of course. I know that fantasy fans may have heard of it, read it and loved it, but this is still a book that deserves a bigger spotlight, to all the rest of the earth that may not read fantasy. This should be read. It's a book that I re-read every summer until the previous one (when blogging made me find so many new books). There was this passion in me that made me wanna re-read it time after time, and I surely will this summer again. It is the book I would save first of all the rest, it is my most cherished book, it might not be a master piece, but I have fallen for it. And I might have a crush on Pug too, lol. Hard one... if you liked an epic fantasy book, with heavy magic in it, you'll probably like this book. I do not want to recommended it only to fantasy fans, I want to recommend it to all. Just take a chance on something different. 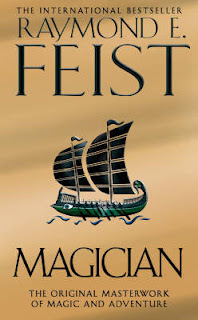 Feist has created a rich world and history with a lot of interesting characters to fall in love with. And the creation of two planets, dimensions, is such a treat in this book. The Tsusuranni world is so different from Midkemia. The first structured around China and Japan, and Midkemia around feudal Europe. It is such a contrast. This book is part of a series, but it is made in the way that you can read just this one and be happy cos the end is a real ending. "This slave is no longer property of this house. He is now the province of the Assembly." This makes no sense reading like this, but oh in the book, love it! The spine has totally cracked at that page and the pages will soon fall off, yes anyone can see which page I have loved. Love that one. I first came across it in another Feist book that takes place in the Tsuranni Empire, and there are 2 places where these two different series meet. This isn't my preferred genre but you are making me want to take a chance with it. They really try to push the book on the cover, don' they? Certainly don't seem like the only one trying to get people to read it! I love the cover with the ship! I will have to give this one a try - I enjoy epic fantasy occasionally but I have to be really, really in the mood. I have never heard of this, but I so want to read it. Jenners- They really do :-) One of the top 100 reads! Jenny- I like that cover a lot, too. So stylized. Aarti, I'd love to participate. I'm a little nervous that everyone will have read my book already, I love it so much -- I've also reviewed it on my blog before, but some time ago. Is that okay, or do you want me to bring something else to light? Email me at my name (with all the "i"s) at uc dot org. Thanks! Wow, I never knew of this book,thanks Blodeuedd for referring this boo, though Iam not into the fanatasy genre much, but this book seems like a good read. I was just at Blodeuedd and thought the book lovely. Now I'm here to say it is a lovely idea Aarti. Oh I do hope you give it a try :D Lol, oh yes they certainly do just that. Trying to spread some fantasy to the world. I am glad you think it sounds good. So excited to see this book is the first one in the spotlight! This is my husband's all time favorite book, and he had me read it about 2 years ago. I loved it and agree that it is a wonderful book for readers of all genres. Just a great, great read. I actually haven't read this one. I should definitely pick it up. I do love a good fantasy. 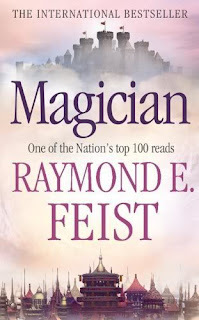 Magician is a fantastic book, one of my absolute favorites. It's a great introduction to the fantasy genre. If anything surpasses it, it's the Empire series. Love it! I love how passionate you sound about this book! Even though I don't read fantasy normally, it makes me want to run out and buy it. Man, I am loving this feature! I hadn't heard of this book, but it looks interesting! It's so much fun discovering a book this way. Such a great series! Thanks for hosting! I never know if *I* should respond to comments in these guest posts, or leave it to the guest poster. I think I'll let Blodeuedd tackle all of these, but I'm so glad you are all enjoying the series! And I hope you all participate, too! You can answer too Aarti :) We can always both do it. Oh your husband has great taste in books, cos I do think it is my all time fav book too. I am glad you enjoyed it also. Oh yes pick it up! I so want more people to read this book cos it is great fantasy. Lol, yes we are after you for sure ;)And we will get you in the end mouwahaha. I do love this book so much, it is my comfort read too. And I would like for others to fall for the world too. Cos it's wonderful. I've been meaning to read this ever since I read Feist's Faerie Tale, which I thought was very original (and scary!). Must get to it. I really enjoyed your spotlight, Blodeuedd, you always make a fun read! Thanks, Aarti! :) And yes, I agree, it's nice to hear from you too, in these guest post comments!